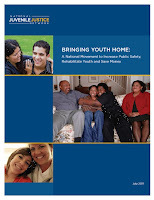 Just Policy Blog: Three Strategies for Changing Juvenile Justice: Which Is Most Likely to Last? To answer those questions, they reviewed -- I'm quoting from the press release -- "the most prominent juvenile correctional reform models from the past 40 years, and they conclude that some models of reform are likely to be more sustainable than others." The "'realignment' approach now being implemented in California and the realignment reforms established in Wayne County (Detroit), Michigan since 2000" is most likely to be sustainable over time. >>Download Resolution, Reinvestment, and Realignment: Three Strategies for Changing Juvenile Justice.